Come learn what it takes to Begin Developing a Positive Body Image! Hint – it has nothing to do with changing your body! But, alas, there is no single answer to this question because body image is deeply personal and subjective to each and every one of us. Contrary to the name, I believe that developing a positive body image does not start with the body, it actually starts in the mind. Changing your body, or at least trying to change your body, may not bring you the immediate gratification and body love you are looking for. Changing your mind, or at least trying to change your mind, may bring you the immediate opportunity to offer gratitude and love for the body you already have. This Tony Robbins quote is perfect for this concept: “Nothing in life has any meaning except the meaning you give it”. This applies to body image as well. Your body image is defined by the meaning and perception you have of your body, which means you have the ability to positively improve that meaning and perception with the power of your thoughts. I believe that body positivity is directly related to the relationship that you have with yourself, and until you can start to understand that, and to really work on developing and improving that relationship, you will always struggle with developing a positive body image. Believe me when I say from experience, you will never be able to have a positive body image if you are not happy with the relationship with have with yourself. I know it sounds crazy, but body image rarely has anything to do with our actual body sizes. There are many beautiful women of all different shapes and sizes that are both happy and unhappy with their bodies. It is interesting to see that what one person is unhappy with, another person dreams of. What is important is to understand is that body positivity will look different to you than it does for me, different for you than it does from your friend. The only image you need to attain to make you happy is the one YOU want to see, the one that makes you the happiest overall. That means not looking exactly like models in magazines or on TV. That means being willing to expand your definition of beauty, and understanding that beauty is in everything, and it is up to us to see that. Just remember that a well-balanced, self loving body positive lifestyle looks different for everyone. 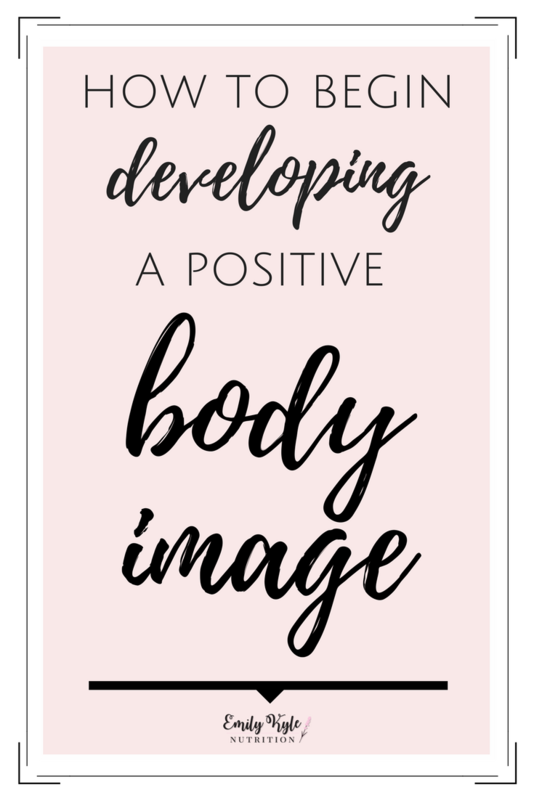 That is why I asked some of my fabulous registered dietitian colleagues to share what their experience has been with developing a positive body image, because yep – we all have struggled with body image at some point too!! Just check out last weeks post where I shared my struggles. And as you read through, I hope you take the time to notice that as these wonderful women share what they know about begining to develop a positive body image, not one of them mention anything about changing their bodies – just their mindsets! “It took a long time to stop measuring my self-worth with my appearance. A bad day at work or my overall success in life had nothing to do with the size of my clothing, and yet that was all I could think about at the end of the day. To be very honest, meeting Mr E is what stopped me from cutting myself down all the time. I had a man in my life who loved me for me. And it got me to wonder that if he could love me for who I am, why can’t I do the same? Over time, I stopped linking my body image and happiness together. I learned to separate the things that go wrong in my day have absolutely nothing to do with the size of my waistline. Instead of blaming everything on my shape, I became a problem solver. I took the logical approach to what went wrong and fixed it. That separation took a long time to be OK with. I now measure my self-worth and happiness by my accomplishments, and even then I aim not to be too hard on myself because I know “perfect” is just a silly word and I’m allowed to be a silly person. 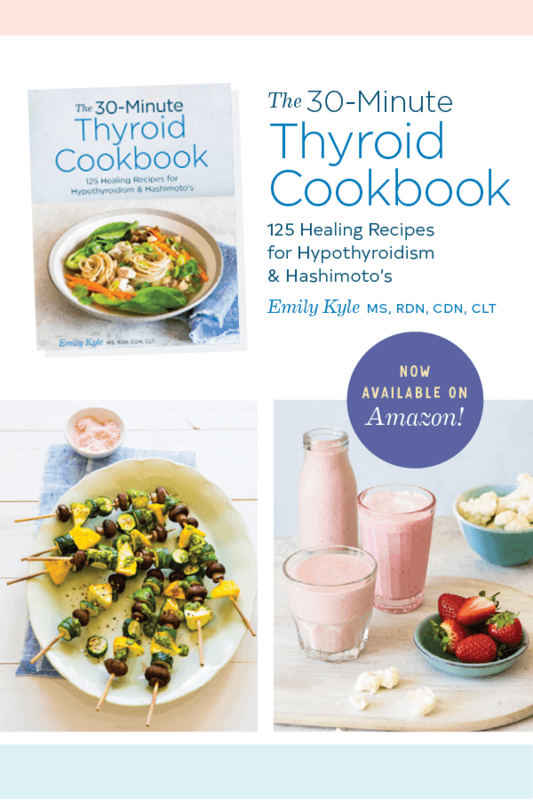 When I became a Registered Dietitian a few years ago after leaving behind my Corporate America life, I made it my goal to teach others to be happy with who they are, and love the ones they’re with because of who they are and not how they look”. “Whenever my negative self talk starts in my head, I try to turn my inner voice toward the positive things my body has done. For example, I have had three children. Sometimes I stare at my sagging skin and stretch marks in the mirror and think they look bad and how I don’t look like I am in my 20’s anymore. I then tell myself that my body is responsible for birthing three beautiful and amazing children and carried them for 9+ months. Besides, I don’t want to be in my 20’s anymore! My flaws come with the wisdom and age of motherhood and all the joy that brings me every day. Sometimes I journal about my thoughts and how I can replace negative thoughts with positive ones to help bring my mindset into a more positive place”. “I learned several years ago that I don’t have a great relationship with the scale. Despite my knowing it’s only my gravitational pull with the earth and it’s only one type of body measurement with a number of limitations. Because of this, I ditched the scale. I removed it from my bathroom and instead check in every few months just to make sure I’m within a reasonable range (and actually, my weight has stayed spot-on so much better without a scale than it ever did with one). If you don’t have a good relationship with the scale, and it makes you feel bad about yourself so you restrict or feel too good about yourself that you begin overeating, consider putting it aside”. “I think that reminding ourselves that society’s ideas of the “perfect body” comes from what media has fed us since childhood is helpful. If I ever do feel negatively about my body, I ask myself what triggered that thought. If it was something or someone I follow on social media, I stop following that person or account. If it is something a family member or friend says, I make it a point to reinforce to them that talking about other’s bodies (even if it is intended to be positive) in turn often makes others feel negative. It also sometimes turns into being empathetic for the person their intense dieting may be due to intensely poor self-esteem”. P.S. Kelly has this amazing blog post titled ‘It’s Time to Talk About Women’s Locker Room Talk’ that ties in perfectly with this concept of How to Begin Developing a Positive Body Image! Be sure to check it out! “There is something so freeing when you finally let go of this impossible standard that you hold yourself to. Having a child has taught me that my body can do amazing things and continues to do amazing things even if you can’t see my abs (or some other ridiculous standard of a “good” body). My daughter doesn’t care if I have an extra roll when I bend down to pick her up, she needs a happy mom who is strong enough to keep up with her. I hope she can grow into a young woman appreciating her body with that same acceptance. Eat food that makes you feel good, move your body in a way that feels good to you, and reflect daily on the amazing things your body has allowed you to do. I hope you soaked up every word of wisdom these strong, smart women have shared with us here, and I hope you are ready to approach how to begin developing a positive body image with a renewed sense of confidence! Just remember, a positive body image does not start with changing your body, it starts with changing your mind and how you talk to and about your body. Of course, I know this is not easy to do when starting out, which is why I would love to share with you this weeks freebie! If you are still struggling or looking for more guidance on how to begin developing a positive body image, I invite you to join me inside my program Diet Culture Detox or to sign up for one-on-one Holistic Health Counseling. Learning to develop a positive body image is just one of the twenty life changing lessons you will learn that will help you to get healthy, and stay happy, without ever having to diet again.